It’s an exciting time for travel. With credit to the millennial masses, wanderlust seems to be a more common affliction than ever before. This likely stems from a generational demand for memorable moments and experiences over material goods, creating what we like to call the experience economy. There are exotic locations, extended ‘bleisure&apos; trips, family vacations, destination group meetings and so much more. 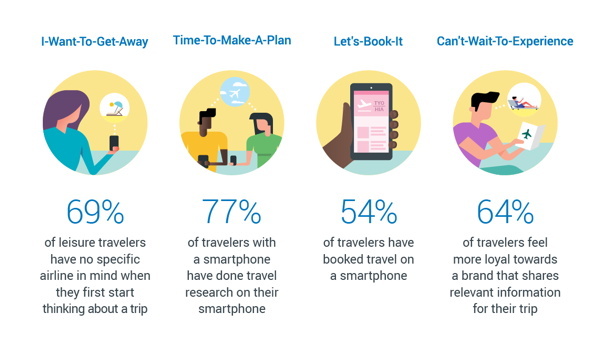 Whatever the purpose of the trip, the travel industry is experiencing an unrelenting demand for unique, personalized travel experiences. Of course, with this demand comes complexity as travel brands look to develop their 2019 marketing plan and remain ahead of evolving industry standards and travel expectations. Modern travelers crave an authentic experience within the destinations they book. It’s important for travel brands to leverage their unique locations, establishments, and experiences to potential visitors. This can be achieved through strategic partnerships and collaborations with local businesses and/or locals, including activities and tour guides and local culinary experience just to list a few. Featuring these partnerships during the booking phase will add to the authentic appeal of the experience offered by your destination. Another effective method is through the use of story-telling, through means of blog posts and engaging longer form articles. Not only should your brand establish itself as a trusted leader with travel insights and a strong reputation but show that you care about your prospective traveler by delivering content that resonates with them. The most effective content marketing strategies, after all, are those which continuously provide value to the consumer before asking them to make a purchase. If the modern traveler is invested in the local, authentic experience that make destinations more attractive and enticing — what better way to provide them value than to distribute stories, posts and information surrounding those experiences? The added bonus? Maintaining a strong content cadence across various platforms (social networks, media publications, your own online site, LinkedIn etc.) ensures your brand is viewed as an engaged, active force, while also helping to solidify your SEO standings. By this we mean, the better and highly targeted content you produce and distribute regularly, the more momentum you will garner, which will continuously help to position your brand in front of the right audience. With the help of social media, brands can maximize exposure with the expansive reach of social media influencers and user-generated content (UGC). After all, the modern traveler loves to share their experience with their following, creating captivating content in the form of Instagram posts, videos (vlogs), blogs and so much more. In fact, according to studies, 87% of millennials look to Facebook for travel inspiration, and 97% will post their experiences on social media. Studies also show that 95% of customers choose a brand that offers relevant content at every stage of the buying process. This represents an on-going opportunity for supercharged content engagement across existing audiences, and with prospective travelers. While it’s still necessary for brands to produce their own content in-house, having a constant stream of UGC for your destination will only enhance your content strategy and create an authentic gallery of traveler stories. Destination brands should create a space for UGC to live on their site and platforms. This could be individual galleries for dynamic, visually appealing content or even blog features for traveling influencers — whatever it is, use that content to tell a story about your destination. This combined force of in-house content (blogs, thought leadership articles, social media posts, press releases and more) with UGC will create a robust content selection that resonates care and expertise. Not only that but aim to increase engagement across platforms for each piece of content. After all, the modern traveler craves unique, local experiences. Whether it’s an Instagram-worthy sunrise hike, hotel property or a local experience that can’t be found elsewhere, the push for one-of-a-kind experiences is paramount. If you’re unsure of where to begin, look at your competitors or your desired audience. What destinations are they talking about? What draws them to that location? What does your destination have that others don’t? Consider this the flip-side of UGC, in which brands have increased responsibility to interact with their customers online and quickly address and remedy negative customer service. Travel brands and destinations must carefully monitor their online reputations through UGC and respond promptly to negative feedback, while amplifying those positive messages and experiences. As technology continues to advance, respective industries around the world evolve in tandem to meet and exceed consumer demands. Content marketing is no exception, as we witness the rising popularity of artificial intelligence (AI) in the form of chatbots and concierge, virtual reality (VR) and augmented reality (AR) content experiences. VR, especially, presents an opportunity for travel brands and destinations to engage prospective travelers by immersing them in an exciting virtual experience. With the help of VR, people who have never considered traveling to a certain destination, can suddenly get a taste of that experience in a totally immersive, transformative way. Even if that experience doesn’t inspire them to add that trip to their holiday plans, they may tell their friends about their experience. For instance, a hotel in Bali might provide a virtual experience of what it is like to be standing on the beach at sunset, exploring the Tanah Lot Temple, or even visiting the Ubud Monkey forest. With the help of a VR headset, individuals can experience the images, sounds and other physical sensations of that experience before they even book the trip. After all, prospective travelers are looking to purchase an experience rather than a product, so what better way to garner interest than giving them a taste of that experience? An example of this concept in action can be found in Thomas Cook’s recent ‘Try before you fly’ VR campaign, which earned the travel company a 190% uplift in their New York excursions and a 40% ROI. This ‘5-minute holiday’ concept allows customers to experience their potential holidays in-store. With 2018 quickly ending, next year is positioned to bring exciting movements to the travel industry as these trends which have recently emerged will continue to evolve and transform. The content marketing landscape is ever-changing, and these methods will continue to make important waves in the world of travel brands and destinations, in 2019 and beyond.